In a time when aesthetics play an important role in our life, a scar can hinder with our peace of mind. A flaw to our desire for perfect skin, scars can be managed and made inconspicuous with the help of advanced Scar Reduction treatments. A scar can prove to be troublesome when they are itchy, painful and restrict free movement or mars our beauty. Though they cannot be removed wholly, they can be made almost invisible. Scar reduction can be fruitful if the following procedures done by a qualified cosmetologist. The cost of the treatment, time of treatment and recovery time are solely dependent on the extent of issue and procedure followed. Corticosteroid Injections – they are used to treat hypertrophic and keloid scars. Pressure Dressing – this scar reduction technique requires dressing up scars to soften and flatten scars. Laser therapy – also called light therapy, this technique uses high intensity light beams to reduce the redness of scars. Skin Needling – also known as micro needling, this is a non-invasive technique used for rejuvenating the skin. Derma Fillers – this technique is used to cure pitted scar by filling them with fillers to plump them up. Cosmetic Camouflage – the patient is trained in cosmetic methods to hide the scars with the help of make-up. Surgery – surgery is used in some cases to alter the shape and size of scar or its location. They are used on scars at joints that restricts movement. This scar reduction method is used in severe cases only as the surgery leaves scars that takes time to heal. Under the expertise of Dr. Rekha, pioneer in the field of weight management, cosmetology and hair management, Rekha’s Skin and Slim Clinic, Mumbai, India, offers advanced treatment in various fields of aesthetic cosmetology. Introducing a set of holistic treatment solutions for addressing the issues of skin, hair and weight management, they combine all modern techniques to serve the needs of their clients better. Signs of ageing are something that no person would prefer to have in his or her body. Wrinkles around the eyes are definitely signs of ageing and everyone would like to get them away. 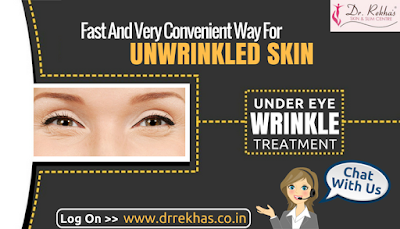 Wrinkles around eyes can be treated in India with great results. Dr. Rekha’s Skin and Slim Clinic provides medical support to prevent and cure wrinkles that are formed around the eyes. It is one of the best clinics that treat wrinkles around the eyes. Wrinkles are small folds in skin that look like lines. Crow’s feet, laughter lines or character lines are wrinkles that are formed around the eyes, mostly in the outer corners of the eyes. They are seen as a sign of ageing as it appears mostly in the mid twenties and then keeps getting worse. They are formed because of the folds that are developed in the skin. Prevention is better than cure, as the saying goes. In the case of wrinkles around the eyes, this proverb is apt. Protection from the UV rays can help the cause and the use of sunglasses while outdoors is recommended. Smoking and dryness of skin are two problems that can lead to wrinkles. Quitting smoking and keeping the skin moisturised by using moisturising creams, water or some other moisturising agent can be the solutions for these problems. In case wrinkles have been formed, home-made remedies which can supply enough Vitamin E to the skin can be used. Using egg whites for face masking can also help. Consuming plenty of antioxidants is also necessary to combat wrinkles. In a clinical atmosphere, Botox treatments are suggested. These injections may be taken from an expert to avoid any complications. Dr. Rekha’s Skin and Slim Center, one of the best cosmetic Clinic in India provides various treatments to remove wrinkles and help to revive your youthful appearance. Tattoo culture is not one that has developed recently. It is quite an ancient concept. With time, passion for tattoos has increased considerably and today many, especially youngsters, exhibit great interest towards tattooing themselves. Though it is interesting to have a tattoo, some may not like to have the same tattoo all the time. In order to change it, they go for tattoo removal treatments which are not that easy. Yes! Tattoo removal is as equally painful as tattoo insertion. Moreover, Tattoo Removal is not always successful. It depends on the type of tattoo. If tattoos are made of dark blue and black, they can be easily removed, whereas green and yellow tattoos are hard to remove. Such types of tattoos need a several number of sessions and different kinds of treatment for removal. Nowadays, laser treatment is highly preferred for removing tattoos. For different tattoo inks, different kinds of lasers are used. It is advisable to consult a doctor to inquire into the kind of laser that is suitable for specific tattoo removal. In general, laser treatments differ from person to person depending upon some factors like age, type, and size of the tattoo, the color of the skin, depth of tattoo pigment, etc. All these factors will influence the tattoo removal technique. Once all these factors are verified, laser treatment procedure can be started. Here is a step by step procedure of laser treatment for removing the tattoo. As a first step, protective eye shields are used to cover patients to avoid direct impact of laser rays on the remaining parts. Initially, the skin reaction is tested against laser to identify the effective energy of the patient for treatment. The treatment comprises a positioning of handpiece against the skin and activating the laser light. Small tattoos require only a few pulses whereas large tattoos need more pulses. In both cases, tattoo removal requires multiple visits and treatments. Undergoing each session, the tattoo becomes lighter progressively. Immediately after the treatment, the treated area is applied with an ice pack for relieving pain. The patient has to apply an antibiotic ointment on the treated area along with a bandage to protect it from the sun. After undergoing the above treatment sessions, the tattoo can be removed completely. All the above side effects are not seen in all cases. These will happen only in case of sensitive skin. So, don’t get into a conclusion and back out in fear. Take the doctor’s advice before starting the process. Dr.Rekha’s Skin and Slim Centre provides best Laser Tattoo Removal in Mumbai all the advanced treatment and procedure with the help of Leading Skin Specialist and other staff. Our skin may not look the same all the time. Continuous exposure to sunlight, acne, and getting older will have a noticeable impact resulting in wrinkles, black spots, and scars on the surface of the skin. In order to bring back its lost charm and smoothness, it is advisable to go in for a Chemical Peel treatment. In this treatment, a chemical solution is used to remove the damaged layers of the skin by smoothing the texture of the skin. Skin Peel treatments are of many types. Among all, chemexfoliation, also named as derma peel treatment, is considered as one of the best treatments to improve the skin appearance. In chemical peel treatment, chemical peels are used on the face frequently which is also used for improving the skin texture on your hands and neck. How does Skin peel treatment work? Skin peel treatment involves the application of chemical solutions on the skin surface for improving the texture of the skin by removing the damaged layers. Phenol, alpha hydroxy acids, and trichloroacetic acid are some chemicals used in this treatment. Based on your specific requirements, the formula of the chemicals is adjusted. Skin peel treatment is mainly classified into three types, viz., light chemical peel, medium chemical peel, and deep chemical peel treatment. Light chemical peel treatment is preferred if your skin has dryness, irregular pigmentation, fine wrinkles, and acne. This chemical peel treatment removes the damaged outer layer of the skin by exfoliation which results in a healthy glow. This treatment is recommended to be done frequently for up to six weeks, so that desired results are seen. 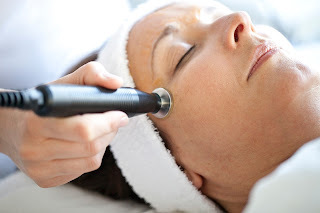 This type of treatment is preferable if you have deep wrinkles, acne scars, and uneven skin tone. Medium chemical peel treatment will help you in the elimination of skin cells from the outer layer as well as the upper and middle layer of the skin. This treatment can be taken once in every 6 to 12 months. Deep chemical peel treatment is highly recommended if you have damaged skin, pre-cancerous growths, deep facial wrinkles, scars etc. Phenol is used for penetration of the lower dermal layer of the skin. This treatment requires a pre-treatment for at least 8 weeks. Dr.Rekha’s Skin and Slim Centre provides Best Skin Peel Treatment in Mumbai all the advanced treatment and procedure with the help of Leading Skin Specialist and other staff. A surgical facelift is no longer the only option for lifting and contouring a face. A non-surgical facelift is used to lift the sagging skin on the face and also neck using surgical suture threads. The benefit of a thread lift is the absence of conspicuous scars and the short downtime from daily activities. Thread lift helps to improve the texture and appearance of the skin. A thread lift is performed within one hour. What Thread lifting can do? Thread lifts can be a great way to rejuvenate and regain youthful contours to areas such as the brows, cheeks, jowls and the neck area. They can also be used to give youthful tone to areas on the body such as the breasts, buttocks and upper arms, places are more vulnerable to sagging and loss of volume due to weight loss, poor muscle tone, or the aging process. The Benefits of A Thread Lift include shaping and lifting and can give impressive results that last from 18 months up to 5 years, depending on the type of thread used. Thread lifts are a good option for those aged 30 to 60 years, for whom gentle sagging may be apparent, but collagens deposits are still enough for regeneration. Younger patients who want to improve their facial contours or those with facial asymmetry may also consider this treatment. How Thread Lifting is performed? In this threads are used for lifting sagging eyebrows along with those eyelids, cheeks, Nasal Flare, lips, Jowls, Neckline, and deep Nasolabial folds are also lifted. While techniques vary according to a patient's specific needs, the doctor's training, and the type of threads used, thread lifting generally involves the use of a thread that is infused under the skin in a way that helps the skin be lifted. Before a thread is inserted, markings are made to determine the proper point of entry, directional vectors and exit point. Based on the type of thread (single direction or bi-directional, for example) the entry and exit points will vary. Aged between 35 and 45 years. Bags under the eyes or on the neck. A full facelift involves 18 APTOS threads and the threads needed per region would usually be 2 for each brow, 3 for each cheek, 2 for each jaw line, and 2 for each side of the neck which amounts to 18 threads. The results are immediately visible and go on to improve in the next 2 months as collagen remodeling takes effect. The threads are invisible, although can sometimes be palpated (felt with the fingers) in certain areas. Some patients feel minimal discomfort such as a sensation while chewing or smiling or slight ache, but this fades within the first week. Slight dimpling, bruising, and swelling are normal within the first few days, but improve readily as the sutures are absorbed. The incisions made for the entry and exit points are tiny and heal without unsightly stitches. Dr.Rekha’s Skin and Slim Centre provides all the advanced treatment and procedure with the help of Leading Skin Specialist and other staff. Are you finding difficulty in sagging skins? know about the nonsurgical treatments available for skin sagging. Weight loss, pregnancy, and old age can result in the sagging of the skin. Radiofrequency and intense pulsed light treatments heat only the deep layer of your skin. The epidermis or outer skin layer is not damaged. Your body's natural wound healing response causes collagen changes in the skin which results in skin tightening. A series of treatments is usually performed. Radiofrequency helps to effectively tighten your skin tissues. It stimulates the repair cells in your skin. Natural wound healing mechanism of the body results in changes in collagen in the skin. This results in Skin Tightening. In Recent years, Skin tightening procedures have become very popular because they provide a nonsurgical alternative to more invasive procedures for correcting skin laxity and improving skin quality. Today, your plastic surgeon can choose among a number of different devices and technologies that provide noninvasive skin tightening solutions. 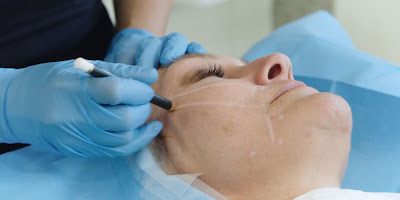 In this Skin Tightening technique, the area or site to be treated is completely cleansed of makeup using skin lotions. Premedication is essential based on the device used, treatment site, your individual requirements. The treatment may take several minutes to complete. 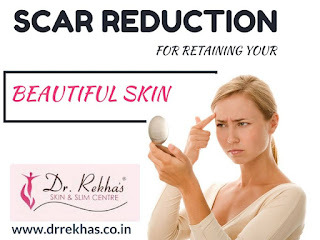 Dr.Rekha’s Skin and Slim Centre provides all the advanced treatment and procedure for Skin Tightening with help of dedicated team of Skin Specialist and other staffs. Rhinoplasty - Accentuate the Beauty in You!! A person's nose can be a very important feature of the face. A disproportionate nose or an irregularly formed one that points in a different direction can get people talking about you for years. Sometimes people even use it as a feature to identify you. This can affect both your personal and professional life. A pimple, or discoloration of the skin, or a weird looking eyebrow is easy to deal with. But being born with a weird looking nose that spoils your looks entirely can ruin the beauty of your face. Thanks to Rhinoplasty also known as Nose Surgery, problems like such can be resolved. Let’s take a quick look that a few things that you need to know about Rhinoplasty. Who is eligible for a nose job!!? Rhinoplasty, how is it done!!? The nose is anaesthetized or made numb. Next, an incision is made down to the cartilage or bone that supports and gives shape to the nose. There are two techniques commonly used, endonasal (from the inside to prevent scarring), or open rhinoplasty in which the incision is made from the outside or top of the nose. Next, depending on the change that needs to be made, the cartilage inside is adjusted to increase or decrease the length of the nose. To make it perfect, at times, cartilages are used to remodel the tip of the nose to make it look thinner and sharper. Following this, the skin and soft tissue covers the bone structure given to the nose making it look perfect. Certain candidates look for more plump or chubby noses. In such instances, fat grafts are used to make it look more fuller in areas desired. How to Choose My Surgeon for Rhinoplasty? Get to know the best rhinoplasty surgeon in the area by screening them out using the following tips. 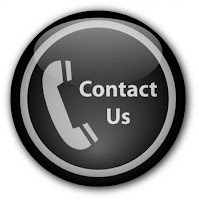 After screening out the best in your locality, make an appointment to meet them in person. Ask questions and make yourself feel comfortable. Get to know them better on levels of customer satisfaction. At Dr.Rekhas Skin and Slim Center, you’ll find all of the above. We are the best because we work with the best. Our customer experience speaks for itself. Walk into Dr.Rekhas Skin and Slim Center with confidence offers best Rhinoplasty Treatment in Mumbai. Let your nose of today be a history of yesterday. 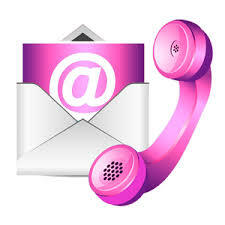 Make an appointment with us without delay!! !